Hiiiiii! How was your weekend? Did it fly by in a hot minute? We planned on putting our tree up, but nixed that idea until next weekend. But, it has to go up then. After that, we are full steam ahead with holiday get-togethers and parties. To me, a big part of the holidays is the whole ‘getting ready’ part….don’t ya think? All of the excitement, preparing and anticipation of what’s to come gets me all giddy. Last week, I was feeling a little meh about the holidays, but I’m starting to get more and more in the mood for it! Baking certainly puts a little pep in my step. 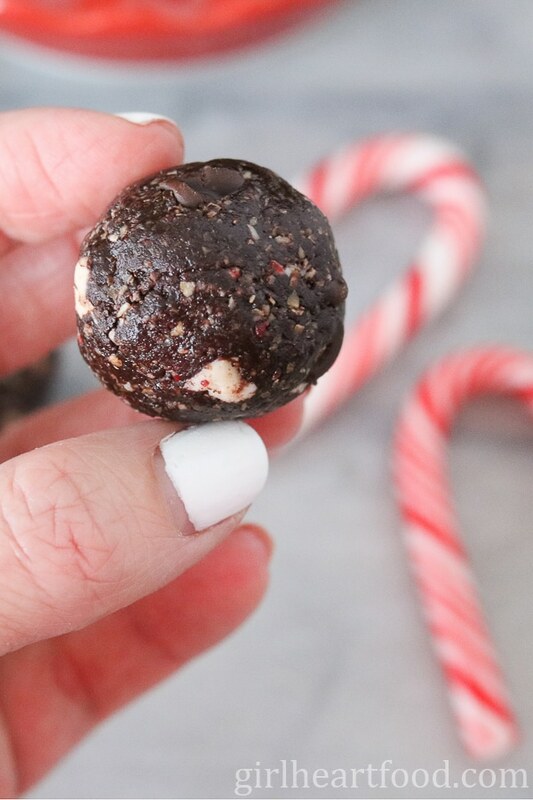 To make these No Bake Peppermint Chocolate Snack Bites, your food processor is your BFF! I use mine on the regular so it’s pretty much taken up a permanent space on our counter. So, you throw the oats in the processor and blitz until it has a flour-like texture, add the remaining ingredients, form into balls, refrigerate for a bit and dig it! If you can’t wait for the whole ‘refrigerate process’ that’s completely fine, but I like how they firm up a bit in the fridge. These are perfect to whip up as homemade foodie gifts this holiday season (or would even make a lovely hostess gift). Wrap up a bunch in pretty packaging and way to go! I dare ya to eat just one! They disappeared really fast in our home….another batch is comin’ 😉 What’s your favourite thing to make for the holidays? P.S. If you need more holiday inspiration, check out my wicked easy Homemade Hot Chocolate. 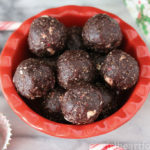 Little bites of holiday goodness - enter No Bake Peppermint Chocolate Energy Bites ! They're the perfect little treat for yourself, Santa or for gifting. Did I mention, they take less than 10 minutes to prepare? Let's me 'em! In a good processor blend oats until finely processed. Add cocoa powder and salt and blend until combined. 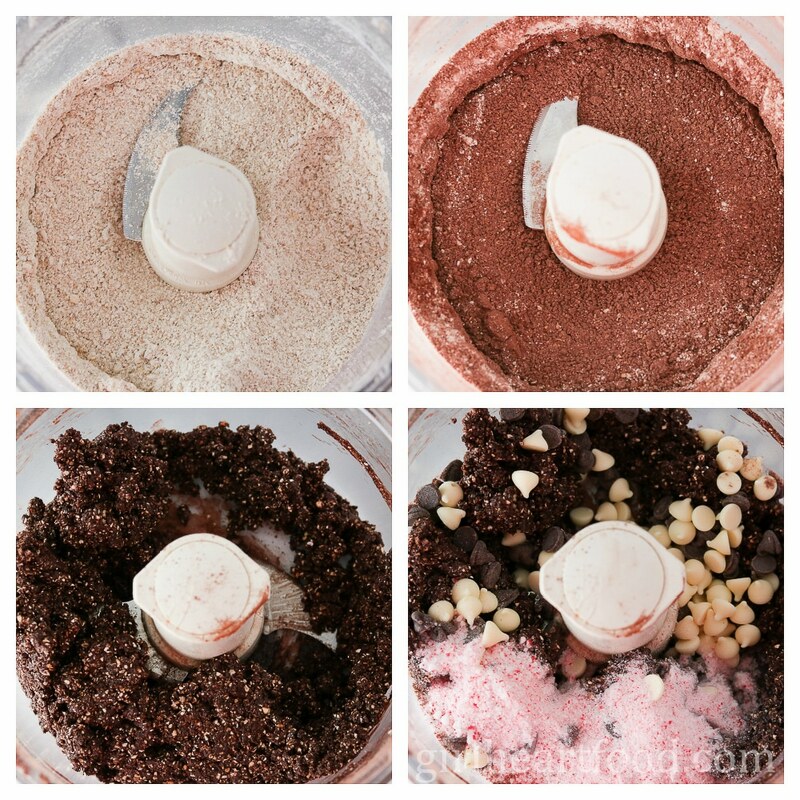 To food processor add coconut oil, honey, vanilla extract, peppermint extract and blend a minute or so until combined. Add chocolate chips and white chocolate chips and pulse a few times until incorporated, but still pieces of chocolate chips. Add crushed candy cane and pulse a couple of times. 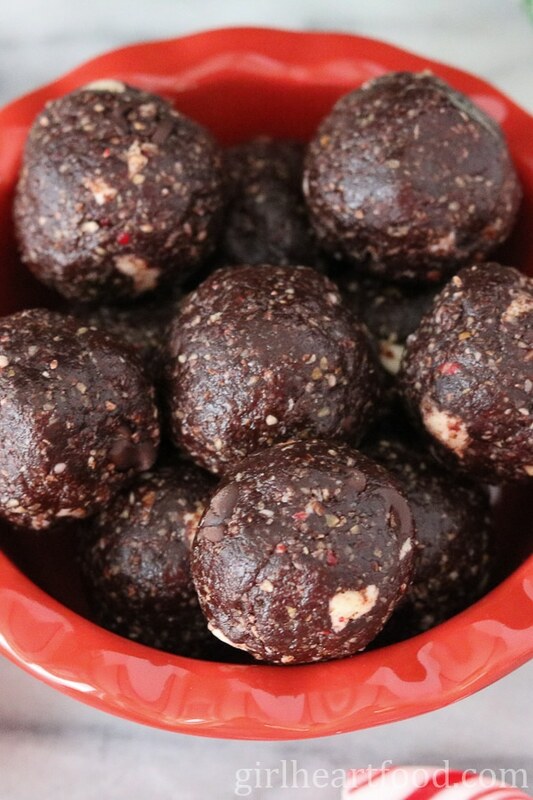 About a tablespoon or so for each energy bite, roll into balls and place on wax paper lined sheet. 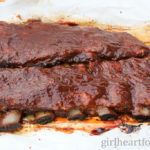 Can enjoy right away, but best when refrigerated for 30 minutes to an hour. Store in refrigerator. Note: They will be firm coming straight out of the fridge (which is ok, but if you want to wait until they come to room temp a bit, wait 10 minutes before enjoying). What a great idea to munch on these bites during holidays. I loved the fact that they look so indulgent and hide good ingredients inside. No bake treats are perfect treats during holidays. I gotta rush to my kitchen to make some right away! They definitely are 😉 Thanks Neha! Hope you like ’em! Hi Dawn! You really make the best snack bites. They always look so delicious and perfect! For some reason when I roll stuff they become oval/rectangle LOL. I’ve been baking batches and batches of cookies and sad to say they have been disasters mostly. Gotta get my cookie baking mojo back! Hope you’re having a great Sunday! Haha! I can’t blame ya there 😉 Thanks so much Christina! Have a lovely weekend! 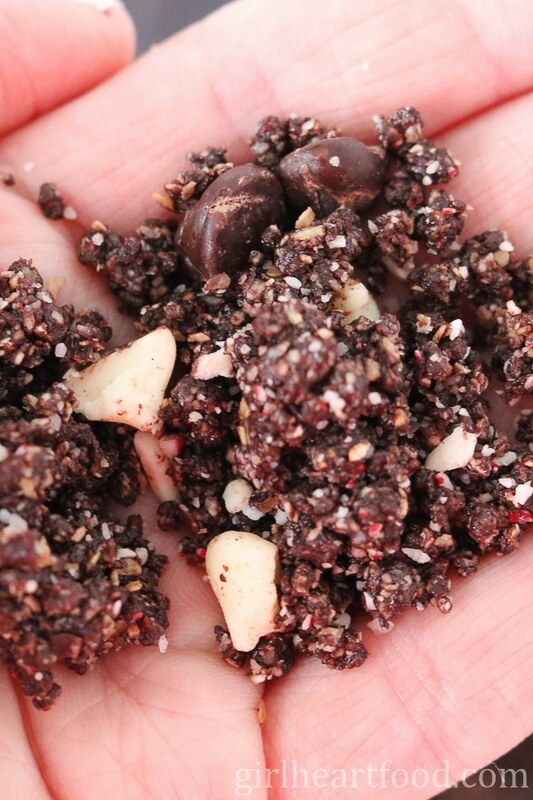 What a great snack – love how easy they are to make! Our tree is already up this year (sent hubby out into the cold to get one last weekend) and I have been baking all week for family & friends. It is such a wonderful time of the year, just love everything about Christmas. Usually, by the end of autumn, I am ready to get the house all decorated but I am not allowed to put any Christmas decoration up before the 1st of December 😉 Have a great weekend, Dawn! Thanks Miriam! I’m starting to get pretty excited – putting our tree up this weekend 🙂 Have a great weekend too! 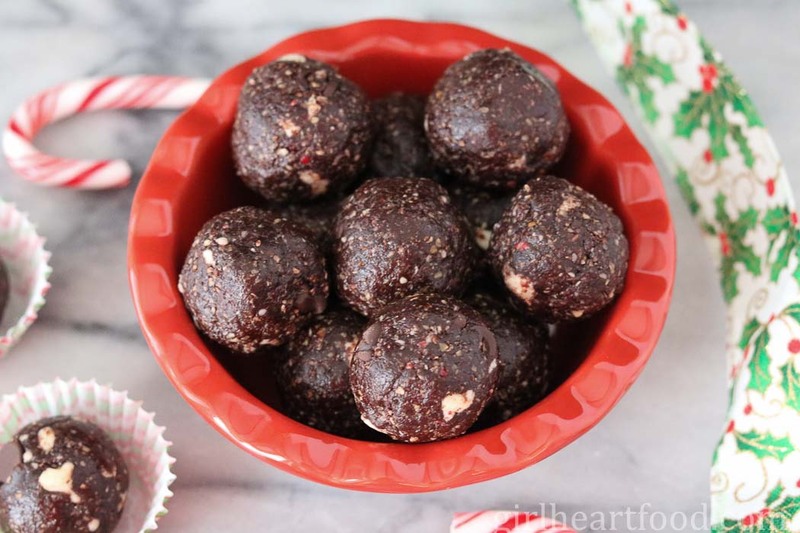 I just love snack bites, and these are so perfect for the holidays!! Peppermint and chocolate goes SO well together. I’m 100% pinning these! Yummy! They really are useful in the kitchen 🙂 Thanks so much, Matt! Hope you get to try them out! My daughter couldn’t wait to get the tree up this year! I bet she would love these peppermint energy bites too! I sure hope so 🙂 Thanks Jennifer! These look perfectly tasty and shareable! I love having different shapes and varieties on cookie platters and these would make an easy, unique addition! Thanks Amy! They certainly would 😉 Enjoy! Happy to hear that Sandi 🙂 Thanks! We put our tree up this past weekend but it’s still naked! I think I need to make a batch of these bites so I can power through the decorating! This is going to be my new favorite Christmas snack!!! My whole family will enjoy these. They definitely would 😉 Thanks Sues! What perfect little bites and no-bake is always good 🙂 We managed to get our tree up this past weekend, so I’m feeling all festive now. Let the baking begin! Thank you Jennifer! Our tree is coming up this weekend 🙂 High five for holiday baking! I will take the next batch you make please:) I am loving the idea of using peppermint flavoring in the bites, don’t think that I have ever had ones quite like that! Very cool to serve as an afternoon coffee treat or packed as gifts to give to colleagues. Pinned! I would gladly give it to ya! Thanks so much, Milena! Cheers to a great week! These bites look delicious and sound so Christmassy! I need more 10 minute cookies in my Christmas baking life! Time is getting short. This weekend flew by, and I can’t believe Christmas Day is in exactly 3 weeks! But we are definitely in the Christmas spirit in our house. Glad to hear you’re feeling it! You’ll be in full Christmas mode once your tree goes up! Have a great week Dawn! No tree for us yet Dawn! I spent the weekend baking in the kitchen! So fun! I’ll get to the tree and shopping soon though! These bites are perfect for the holidays! I always love the chocolate peppermint combo during the holiday season! Pinned! Sounds like a fun weekend to me (as long as there was taste testing 😉 ). Thanks so much Mary Ann! 10 minutes!? Now I can definitely get behind that! I agree that holiday baking totally puts a little pep in my step. There’s just something so comforting about baking on these cold early winter days! And then I just want to curl up on the couch with my baked creation and a glass of wine and binge watch Netflix all night. 🙂 Hey, it’s the holidays…you’re totally allowed to do stuff like that! 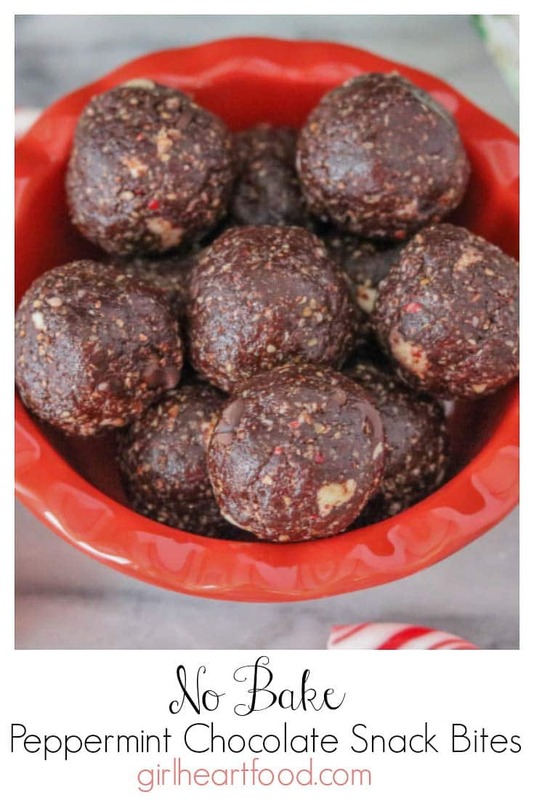 I definitely need to give these snack bites a shot as I love chocolate + peppermint…especially during this time of the year! My favorite part of Christmas is the getting ready part. Christmas Day is always kind of a letdown because there are no more preparations to do :). Have fun putting up your tree next weekend! I think my weekend will be filled with eating these energy bites to get ready for heading up to my parents’ house for Christmas. I need all the energy I can get. And all the chocolate and peppermint too! Right?! Haha – I hear ya, Kelsie! Thanks so much! How cute are these little bites?! You know I’m a huge fan of no-bake anything, so these sound perfect for the season. And I totally agree that preparing for the holidays is half the fun of it. It just goes by SO fast! I would love to be munching on a few of these cuties while watching some Christmas moves. Pinned! Happy Monday to you! Thank you Gayle!! Eating these, watching Christmas movies sounds perfect to me 😉 Have a lovely week! What? Super early! Lots more time to enjoy it, though 😉 Thanks Cheyanne! Have a great week!